Stand up paddleboarding (SUP) offers a fun, relaxing way to play on the water. With a minimum of gear, you can paddle ocean surf, lakes and rivers—no waves required. To find the right one for you, consider a board’s weight, volume, capacity and size. Paddleboards come in 2 main types: all arounder planning hull and touring / racing displacement hull. The beauty of these boards is that most are suitable for several types of paddling. All Arounders: These offer a traditional surfboard-style “planing” hull and are 10' to 11'6' long, 29" to 33" wide. They are best for beginners, anyone who paddles on a calm lake and stays close to shore, or those who want to fish from their boards. Race, touring and downwind SUPs: These have a pointed nose or bow (front end) and a rounded, kayak-like “displacement” hull; most are 12'6" or 14' long. The pointed nose or bow is more efficient and requires less effort to paddle longer distances. Race and touring boards tend to have a narrow width, so make sure to get something that is stable for you. Kids’ SUPs: Kids can use several types of boards depending on the situation. A shorter all-arounder board for kids (about 9’0" long) is a lot easier to carry and maneuver than a board made for adults. Kids boards are narrow just like their shoulders so when they paddle they are paddling straight down next to the rail unlike adult boards which are wider. Another very important thing is a kids paddle. A kids paddle is designed specifically for smaller paddlers and both the shaft and blade are made smaller. Family Board: Worry Free Full EVA Soft-Top Family Paddle Board is a user-freindly design for fun for all of the family. Its a long board style combing a wide planning nose and stable squash tail make for an ideal beginner board. Great for the kids to beat up and not have to worry about it. Boards for women: SUP boards tend to be heavy, hard to carry and a challenge to remove from the top of your car. Board makers have responded to this problem by offering ultra-light boards that are easier for smaller adults to carry. Some have a narrow mid-section to help you reach both the deck handle and opposite side of the board. Before purchasing any paddle board make sure you research the weight of the board. The average weight of a paddle board should be 20-30 pounds. The new comfortable grip butterfly handle is a game changer. Stay away from old carrying handles. This type of handle makes it very difficult to pickup and carry. 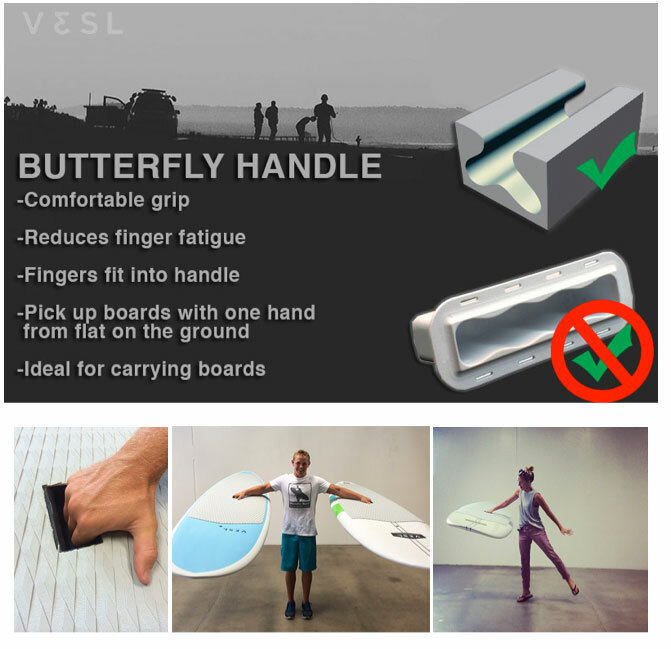 The new Butterfly handles make it very easy to carry your board. Board width is the most important factor in determining stability. SUP boards are made up to 33" wide to accommodate a variety of body types. Wide boards (about 31" or wider): Ideal for larger people or anyone with poor flexibility or recent leg or hip injuries. The added width and thickness help displace your weight in the water. Narrow boards (29" to 30"): Smaller paddlers (up to 190 lbs.) should consider a narrower board which is more maneuverable and lighter to carry than a large board. First and foremost, a SUP board must work for your size. If the board doesn't displace the correct amount of water for your weight, you won’t be supported. Consider, too, board length in regards to your type of car, home storage situation and length of walk to the beach or shore (longer boards are more difficult to carry, especially in windy places). Average size surf style paddle boards (10' to 11'6'): Beginners or anyone seeking a relaxed outing with no particular destination in mind will likely be happy with a shorter board. Experienced surfers require a short board for more maneuverability. Touring & Racing displacement paddle boards (12.6' or 14'): Longer boards are faster than short boards. If you're interested in racing or touring, you'll need a longer board to either keep up with the competition or to paddle several miles to your campsite. Boards are made from several different materials, with an EPS foam core wrapped with fiberglass, carbon fiber or plastic being the most common. Boards can be hollow or solid. Most rotomolded boards are hollow due to their manufacturing process however very heavy, while some high-end boards may be hollow in order to save weight and increase performance. Plastic (rotomolded): durable exterior; affordable; heavy. These boards are great for rentals companies or going down rivers rapids. Fiberglass and epoxy over EPS foam: mid-range price; can be used for many types of paddling. This is the most common board type. Construction techniques vary with these boards, so weights vary widely, too. Some boards have a sheet of wood under the fiberglass deck to add durability and stiffness; others use an infused epoxy process that makes the board's exterior extra tough. Inflatables: very durable; light to carry; can be used for a variety of paddling, from whitewater to slow speed. Made of PVC with drop-stitch construction, inflatables are easily stored in apartments, the overhead compartments of planes or in the back of your car. Softtops: is a user-freindly design for fun for all of the family.. The boards hard bottom cover and ultra high density EVA rails increasing impact resistance allowing you to walk to both ends of the board or have your dog with you on the board. Softtops are your worry free paddle board. SUP delivers a full body workout and thus has become a popular cross-training activity. And since you stand at your full height, you can enjoy unique views of everything from sea creatures to what's on the horizon. If you have any questions please don't hesitate to call us (949) 574 5897 or email us.